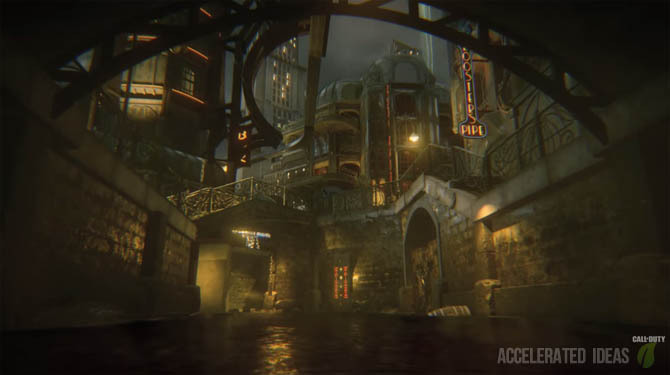 Treyarch are taking zombie fans on a brand new adventure in Black Ops 3 to a Film Noir theme sometime in the 1940's. From the reveal trailer we saw a tonne of new features including candy machine perks, tentacle boss zombies and new craftable weapons. Many fans had hoped for a World War 2 setting for Call of Duty 2015 but as soon as Black Ops 3 was announced that idea was buried instantly. This reveal trailer is way outside of any real life war setting and goes into movie mode for some really odd characteristics. The entire reveal trailer shows that Shadows of Evil is based on a familiar Mob of the Dead theme, both dark and gritty. Mob of the Dead was easily one of the best zombie maps from Black Ops 2 and it's no surprise that Treyarch want to extend this idea. The map combined some great guest stars into an authentic alcatraz map with an awesome and inventive Easter Egg puzzle to solve. Possibly a replacement for the Perk-a-Cola machines in past zombie maps, candy can be purchased by any players resulting in a different coloured sweet. The effect of this sweet depends on the colour which is completely randomized. I'm not convinced that this is a complete replacement for the traditional Perk-a-Cola machines because it looks more like a time limited power-up rather than a permanent perk. If you look closely at mark 1:16 in the reveal trailer, the player eats a purple sweet and then immediately afterwards the zombies avoid him. This reminds me of the vulture perk from Buried where players could kill zombies and then walk on the green mist to become shrouded from zombies for a brief moment. The first of the Wonder Weapons shown in the trailer occurs at the 0:57 mark. The female character is holding a blue dagger like weapon, which she uses after leaping into the air and smashing the ground. The result is an electric shock for zombies in the vicinity. Yes it's just like a Titan's super from Destiny. At roughly the 1 minute mark we can clearly see a craftable shield which can be used as a form of protection from zombies and also as a ram to charge zombies out of the way. Using the trigger button will place the shield in front of the player, with a sizeable view port to continue viewing straight ahead. One of the four screenshots from the Activision website shows the familiar chalk outline of a wall weapon, thus confirming that players will be able to purchase wall weapons in the usual way. At the 0:55 mark, we see a throwable weapon, very similar to the Hell's Redeemer weapon from Mob of the Dead. This weapon is thrown by the player and then swings back round like a bomberang ready for another throw. Possibly the strangest monster in the reveal trailer, this beast looks awfully similar to one of the beasts from Ghosts (Extinction) and that's not a good thing. I really hope that Treyarch stays well clear of the boss monster theme and sticks to the traditional round based boss instead. Anyway, to kill the boss monster it looks like you need to destroy each of the three heads. I hate flying monsters, I really do. Again I really hope that these things are few and far between in the zombies mode. They appear in groups in the trailer so this could mean that they're round based rather than a consistent threat, much like the dog round from older maps. Not much firepower is required to take these things down, at which point they explode into a pool of yellow liquid.